A study on recycling suggests Britons are the worst in Europe when it comes to recycling electrical equipment. Computer manufacturer Dell found that fewer than half of UK residents regularly recycled old hardware, compared with more than 80% of Germans. Within the UK, the Welsh are the worst when it comes to recycling technology; almost 20% have never done so. It is thought the UK creates enough electrical waste each year to fill Wembley Stadium six times over. Environmental consultant Tony Juniper said that lack of awareness was a serious issue. "Governments in every country need to make the disposal of old electrical equipment as accessible and commonplace as recycling old paper, plastics and glass," said the former Friends of the Earth director. In early May, mobile operator 02 looked at what electrical equipment was inside a typical home. It found that there was an average of 2.4 TVs, 1.6 computers, 2.4 games consoles, 3 mobile phones, and 2.2 MP3 players. 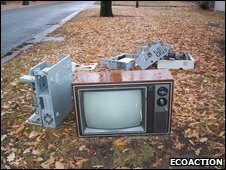 Introduced by the European Commission in 2002, although not coming into force in the UK until January 2007, the Waste Electrical and Electronic Equipment Directive (WEEE) was European legislation designed to "reduce the amount of electrical and electronic equipment being produced and to encourage everyone to reuse, recycle and recover it". Jean Cox-Kearns, recycling manager with Dell, told the BBC that one of the reasons Britain lagged was because other countries had implemented the WEEE directive two years before. "The UK had historic legislation that they had difficulty in implementing," she said. There are concerns that many items that are disposed of - especially computer equipment - still work but have been rendered obsolete by new technology. A number of charities actively collect IT equipment so it can be used in the developing world. Ms Cox-Kearns acknowledged that was preferable to recycling, although she did have reservations. "I agree we should maximise the use of computer equipment. However, we need to find out what happens to the equipment after they [the recipients] are finished with them, otherwise it is effectively dumping."